We are leading manufacturer of Silver Plated Kolhapur Mahalaxmi Idols. Leveraging on our in-house production unit, we are presenting a wide assortment of 24 Kt Gold and 999 Silver Plated Kolhapur Mahalaxmi Idols. 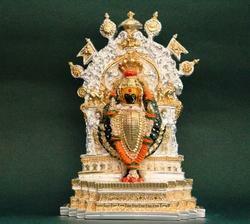 These idols are obtained from 100% pure gold and silver. The offered idols are developed using pure gold and silver metal. After sanctified using Beeja mantras or panchakshar mantra, the provided idols attain the specific impulses power to offer peace and prosperity at home and office. The provided idols can be availed by clients from us at pocket friendly rates.